The Esaki tunnel diode is a semiconductor p-n junction that uses the phenomenon of quantum tunneling to its advantage. The junction between the two doped semiconductor materials creates a potential barrier between the valence band of the p-type material and the conduction band of the n-type material. If the potential barrier is thin enough, and depending on the bias of the junction, individual electrons can tunnel either “forward” or “backward” through the potential barrier, collectively creating a current. In fact, the tunnel diode exhibits the unique characteristic of having negative resistance at particular levels of forward bias. I have approximated this potential barrier in order to perform the sort of one-dimensional analysis we did in class. My goal is not to find accurate numerical quantities that describe a real-life Esaki diode, but rather to apply what we learned about potential barriers in class in order to demonstrate the relationship between the dimensions of a barrier and the transmission coefficient of an incident wavefunction in the context of a real device. 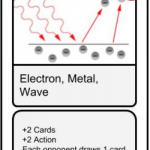 Whereas electrons in individual atoms have discrete, quantized energy levels, electron in solids interact with each other in such a way as to form continuous “bands” of allowed energy. In semiconductors, we focus on the valence and conduction bands. At absolute zero, the states in the valence band are full, but optical or thermal excitation can excite electrons up to the conduction band – a necessary condition for the semiconductor to conduct electricity. When an electron is excited in this way, it leaves behind a corresponding “hole” – simply the absence of an electron – which can be thought of as having the electron mass with opposite charge. Together these are known as an electron-hole pair (EHP). Semiconductors are often doped, meaning an otherwise pure semiconductor material has been injected with a small concentration of atoms that allow either for more electrons (n-type), or more holes (p-type). Every semiconductor has a fermi energy, below which almost all states are occupied, and above which nearly all states are vacant. An undoped semiconductor has fermi energy approximately halfway in between the valence and conduction bands, but n-type doping raises the fermi energy and p-type doping lowers it. The Esaki diode uses degenerate materials, which are doped so heavily that the fermi energy is outside the band gap. When p- and n-type semiconductors are joined together, they form a junction. 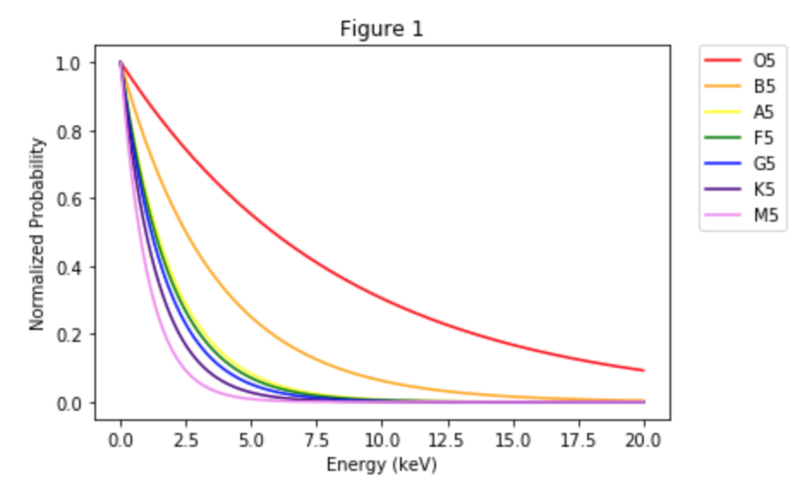 At equilibrium, the fermi energy must remain constant, which causes the bands of each material to bend with respect to one another by a quantity qV0, called the contact potential (times the elementary charge), over a depletion region of width W. When a bias, or voltage, is applied to the junction, the fermi energy can then have different values //on either side. The tunnel diode is simply a p-n junction with the correct conditions for tunneling to occur. First, the contact potential is high enough that the valence band of the p-type region overlaps the conduction band of the n-type, so that an electron can tunnel through the potential barrier from one side to the either. This condition becomes hard to maintain at certain levels of forward bias – as the voltage increases and the respective valence and conduction bands move out of alignment, the tunneling becomes less likely per electron, resulting in a weaker current. Second, the materials must be degenerate to create regions of empty states. Third, the junction must have a forward or reverse bias, so that the fermi energies are unequal and thus an empty state can exist across from a filled state. 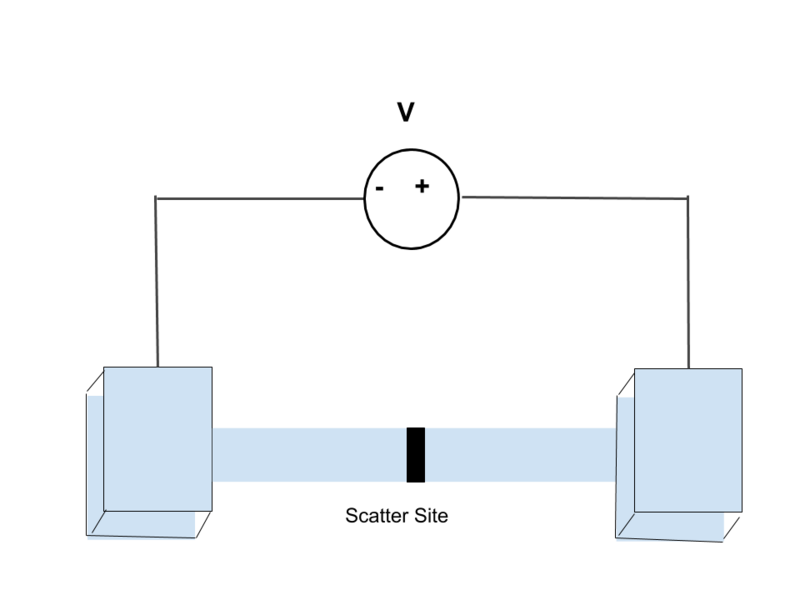 Fourth, the width of the potential barrier must be narrow enough for electrons to be able to successfully tunnel from one side to the other. It is this last condition that we will be modelling. Fig. 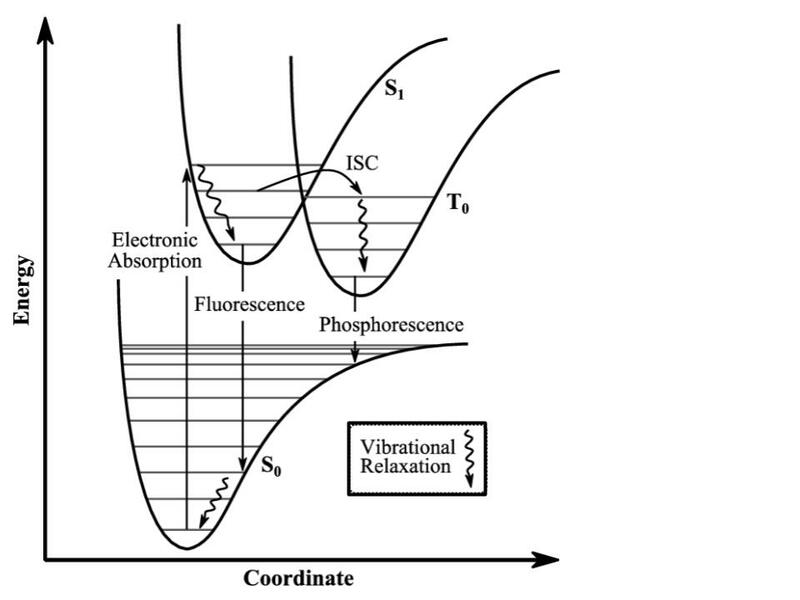 1: Band diagram representing Esaki diode under tunneling condition. The diode is reverse biased, allowing an electron on the p side to tunnel across to an empty state on the n side. The Esaki diode’s potential barrier looks different from the barriers we’ve examined in class, in that it actually comprises two energy functions. Counterintuitive as this is, the important aspects of the barrier are its width, approximately W, and its finite height, qV0. Thus, since the “sides” of the barrier are nearly vertical when highly doped, we’ll approximate it as a simple rectangular barrier with the same dimensions. The potential on either side can simply be 0. Fig. 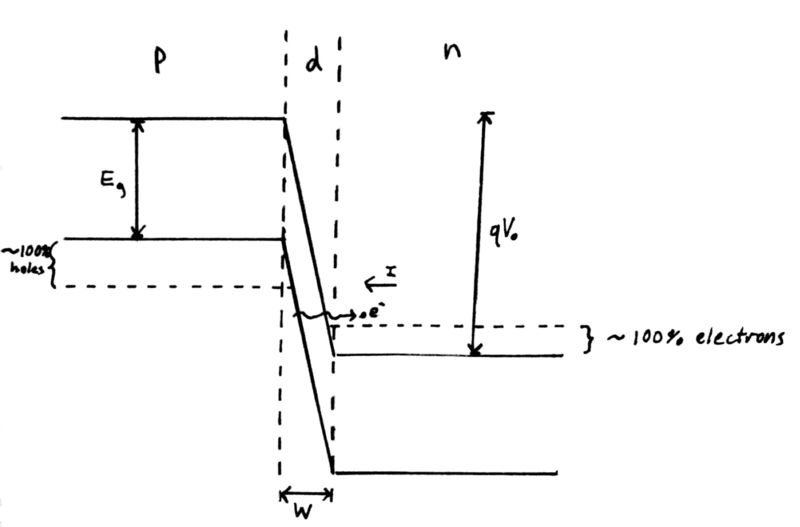 2: Rectangular potential barrier representing Esaki diode barrier. This model has the same height and width as the real barrier. This expression makes sense, because the limit as W goes to infinity is 0, and the limit as W goes to 0 is 1, meaning the electron is only likely to tunnel for small W. Note also that as the contact potential V0 goes to infinity, T goes to 0, as we would expect from an infinite potential well. 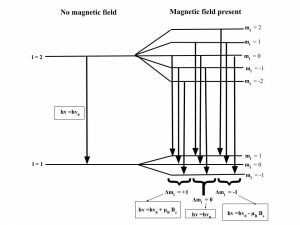 Initially, we assumed the electron was incident from the p-side, as in the reverse bias case, but the mirror symmetry of our model means that as far as the barrier is concerned, we can expect identical behavior for an electron incident from the n-side. Fig. 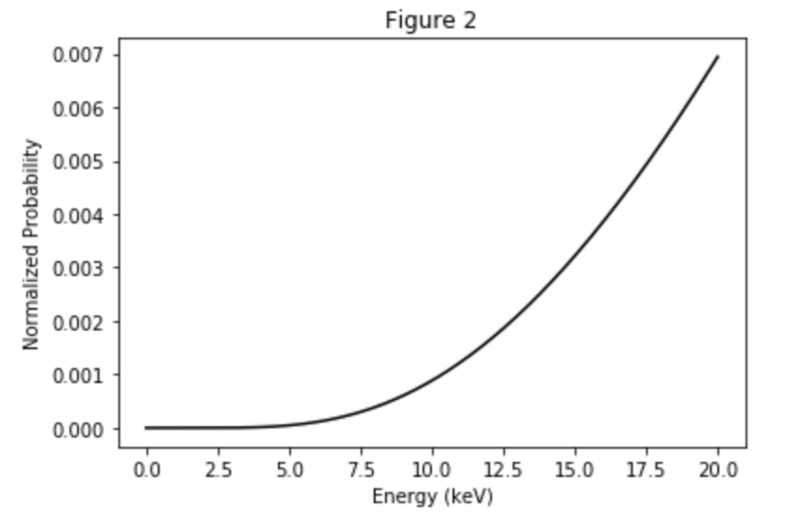 3: This graph was produced in Mathematica using rough estimates for the energy values in the T equation. The numbers on the axes are not intended to represent actual quantities, and the graph merely suggests the shape of the function. 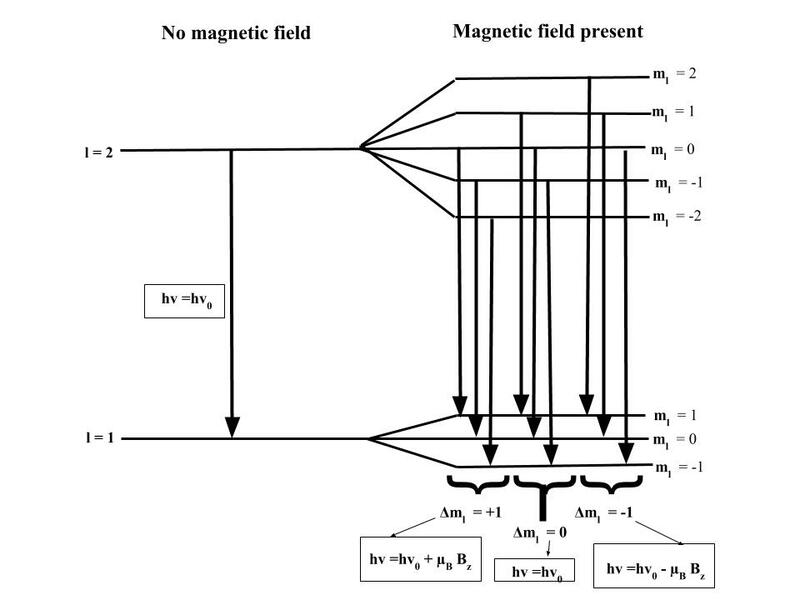 Although this model is very much an oversimplification of what the potential barrier in an Esaki diode actually looks like, it demonstrates the sort of behavior we would expect from the real thing, namely the behavior of the transmission coefficient with respect to the extremes of barrier width. 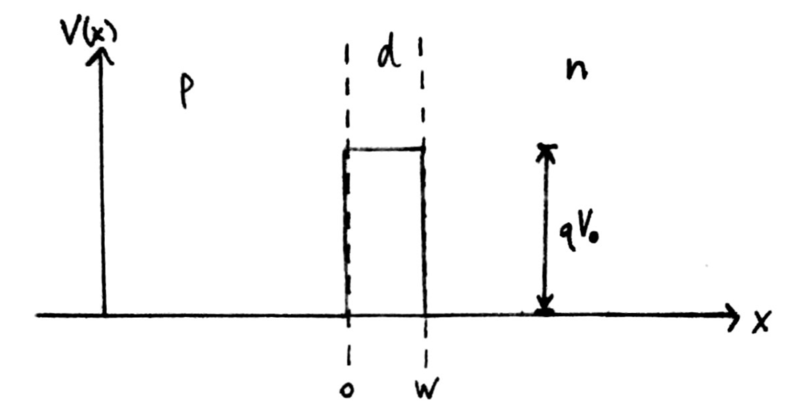 Although the key characteristics of the tunnel diode are dependent on the doping of the two semiconductor materials, which falls outside the scope of this course, the rectangular barrier model focuses purely on the quantum mechanical process that lies at the core of this diode’s function. Goswami, Amit. (1997). Quantum Mechanics. (2nd ed.). Waveland Press, Inc.
Griffiths, David J. (2004). Introduction to Quantum Mechanics (2nd ed.). Prentice Hall. Streetman, Ben G., Banerjee, Sanjay Kumar. (1988). Solid State Electronic Devices (7th ed.). Pearson. This entry was posted in Evan on December 17, 2018 by evstark. For my project, I worked on the shot noise experiment and explained the concept of shot noise from a quantum mechanical perspective. The experimental component was necessary to understand how shot noise can be observed and measured. It was also necessary to model how transmission probabilities change with a changing voltage. The quantum mechanical component was necessary to describe an application of tunneling through step potential and its effects. Noise can be observed when an electric current is generated from random independently generated electrons. 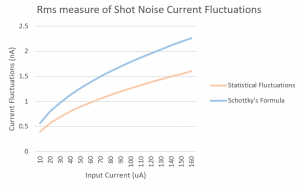 Shot noise exists in certain macroscopic electric currents and can only be observed when the electric current is amplified thereby amplifying the noise. Shot noise is a result of the discreteness of electrons where the number of electrons arriving over a given period can be described using the Poisson distribution . 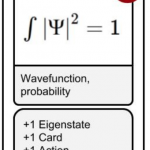 The randomly generated electrons create an uncertainty in the arrival of electrons. The standard deviation in the number of electrons arriving during that period is given by the square root of the number of electrons arriving for that period . The statistical fluctuations in the arrival of electrons result in statistical fluctuations in the charge about its mean. These fluctuations are what we refer to as noise and can be observed through the shot noise experiment . Fluctuating currents have also been theorized by Landauer  to result from random transmission of electrons from one terminal to another as individual electrons move across a potential barrier. The conductor can be modelled as N independent channels arranged in parallel to create the conducting wire . In this case, each scatter-site can be thought of as a gap in the conductor. Electrons tunnelling through each independent channel, have a transmission probability Tn . 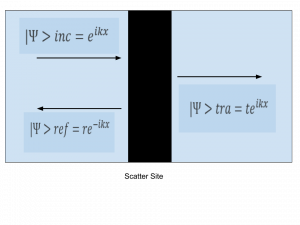 The transmission probabilities can be computed using the scattering matrix approach or by using Landauer’s formula. This can be modelled as shown in Figure 1 below where electrons tunnel through the scatter site when moving from one terminal to the other. 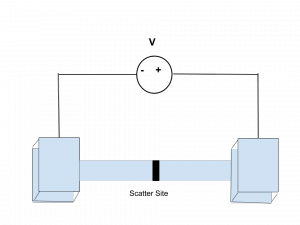 The wave packet tunnelling through the scattering site from the left of the scatter site to the right of the scatter site generates a current pulse. Electrons can tunnel from the right of the scatter site to the left of the scatter site, or vice-versa. The tunnelling of electrons is random resulting in fluctuating currents which we observe as noise . 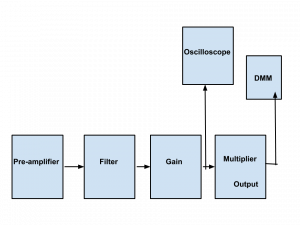 The shot noise experiment is set up as shown in the block diagram below. 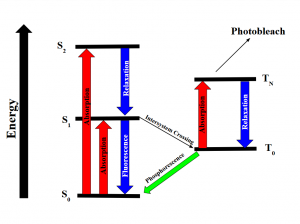 A photocurrent ejects statistically independent photoelectrons. The current is passed through a load resistor producing a dc voltage. In the low-level electronics (LLE), there is a high pass filter that passes frequencies above the cutoff frequency. The current is passed through an op-amp with a gain (G=100) in the preamplifier. The output of the pre-amplifier is then sent to the high-level electronics that includes a low pass filter and a gain (G=6000). The output from the HLE is an average amplified noise voltage. The frequency bandwidth that the high pass and low pass filter create determines the period over which statistically independent arrivals of electrons can be made. This amplified noise voltage can be calculated, and theoretical results compared to the experimental results. For this project, only the theoretical results were considered. 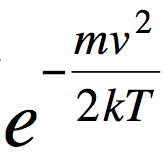 An expression for the standard deviation in the current was used to calculate the rms measure of current fluctuations. These fluctuations were also calculated using Schottky’s formula (Eq 1). The two methods were used to compute the expected current fluctuation rms measurements . The model used to compute the expected current fluctuations was used to compute the sum of transmission probabilities of the N independent channels in the conductor. Landauer theorized that the time-averaged current can be computed from the conductance multiplied by the voltage and the sum of the transmission probabilities as shown in equation 3 below . The sum of transmission probabilities was therefore calculated from the time-averaged current and the voltage using Eq 2. Figure 3 below shows the results of the rms measure of the current fluctuations calculated using both Schottky’s formula and from the standard deviation in the current. From the graph below, the Schottky formula can be approximated as a suitable measure of shot noise current fluctuations as the current fluctuations are nearly equal. 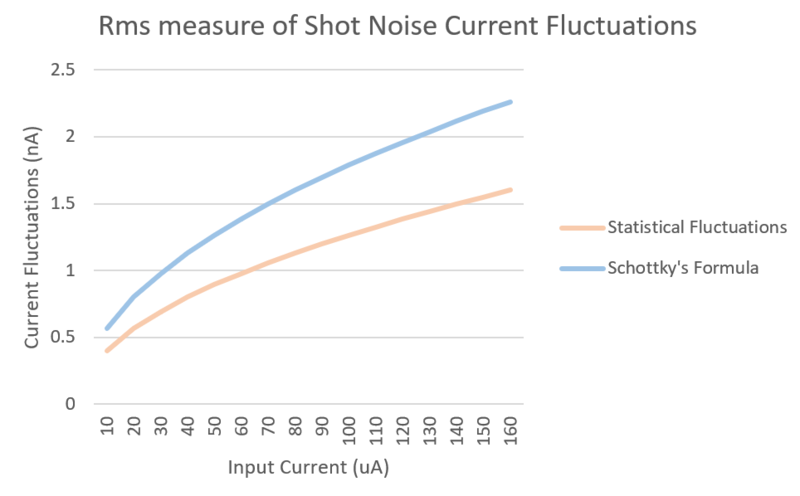 The average power transmitted by a noise source is proportional to the shot noise amplitude and is therefore proportional to the average dc current and to the as seen from Eq 1 and Figure 3 below. 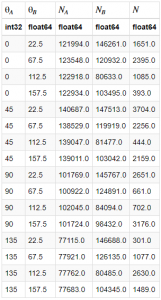 The average power is also proportional to the bandwidth frequency. 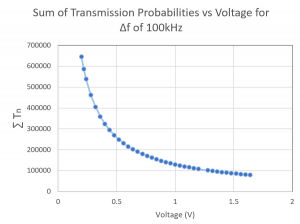 Figure 4 below shows how the sum of transmission probabilities of n channels changes with changing voltage. 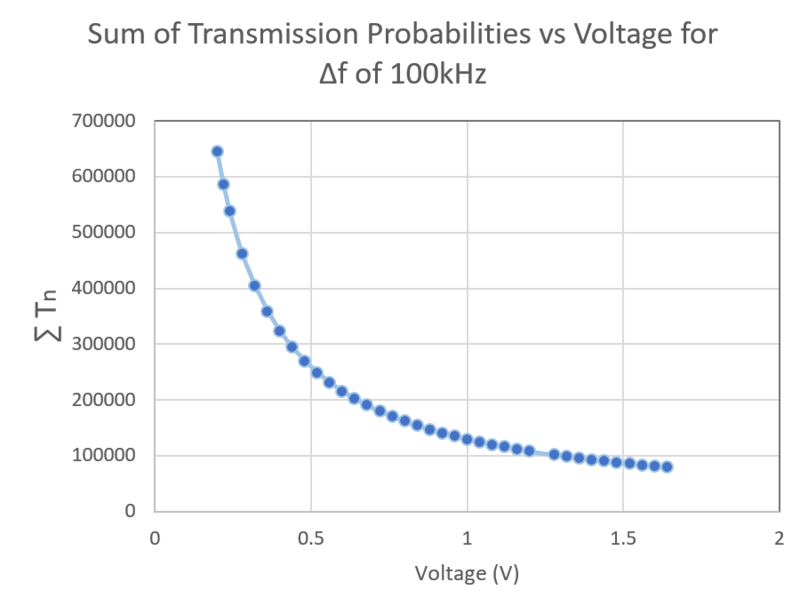 The sum of transmission probabilities decreases exponentially with an increased voltage as seen in Figure 4 above. This corresponds to what we expect from Ohms Law and Landauer formula where conductance (1/R) increases with increased transmission probability, and conductance is inversely proportional to voltage. It, therefore, follows that transmission probability decreases with increased voltage. Another approach to computing transmission probabilities is through the use of the scattering matrix. The scattering matrix has extensively been used to describe quantum transport by describing the relationship between electrons approaching a scatter site from the left and electrons approaching a scatter site from the right . 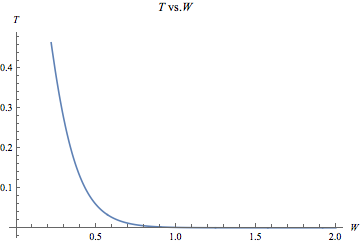 The wave equations for electrons approaching the scatter site from the right are similar to those shown in Figure 3 however the reflection and transmission coefficients r’ and t’ respectively . The scattering matrix shown below is thereby necessary to calculate amplitudes of the waves approaching the scatter site from the left and those approaching the scatter site from the right. 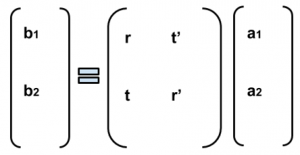 This offers an alternative way to compute transmission and reflection probabilities. In conclusion, this study has found that fluctuations in an electric current can be attributed to the discreteness of electrons where we can use Schottky’s formula to calculate current fluctuations. It was also found that noise can be attributed to the uncertainty introduced by electrons tunnelling through a scattering site. The probabilities of transmission can be calculated using Landauer formula or could be found using the scattering matrix approach. 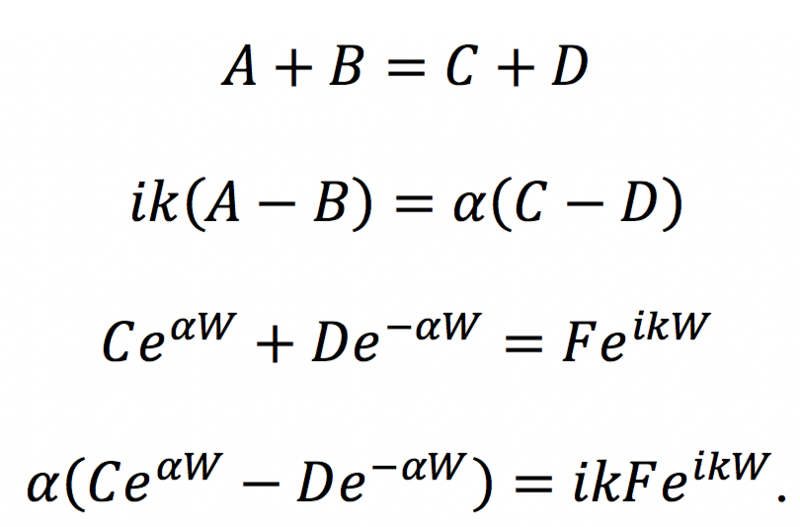 The Schottky formula was found to closely match the count statistics approach to compute current fluctuations. It was also found that the sum of transmission probabilities decreased with increasing voltage. Datta, S. (1995). 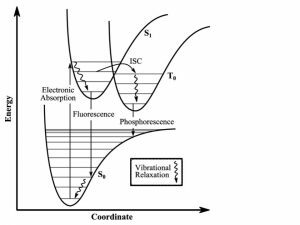 Electronic transport in mesoscopic systems. Cambridge: Cambridge University Press. This entry was posted in Shishi on December 17, 2018 by wagachuhi. 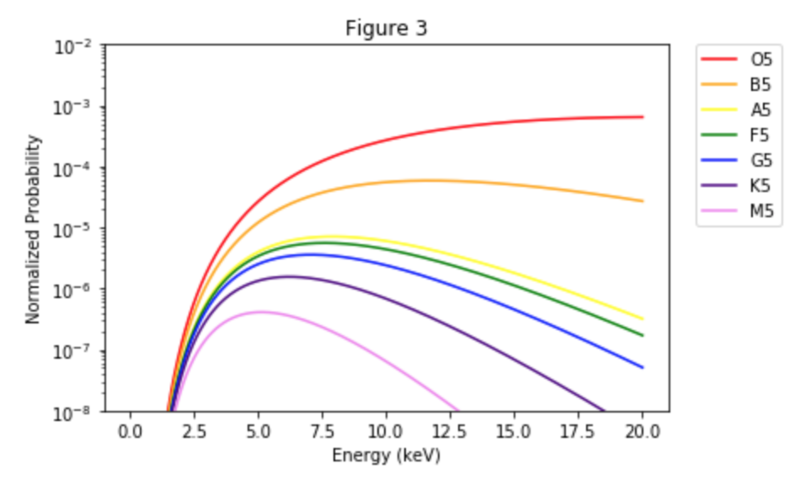 In my project, I will be modelling fusion reaction rates across stars of different spectral types. 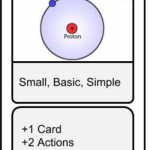 Specifically, I will be looking at the first step of the proton-proton chain in nucleosynthesis, with the quantum tunneling of one proton into another. The broad categories of spectral type are: O, B, A, F, G, K, and M. They are further divided into subcategories, being assigned their spectral type letter along with a number between 0 and 9 to specify where within a spectral type a given star falls. For my calculation, I will be looking at the intermediate subcategories of these spectral types: O5, B5, A5, F5, G5, K5, and M5. 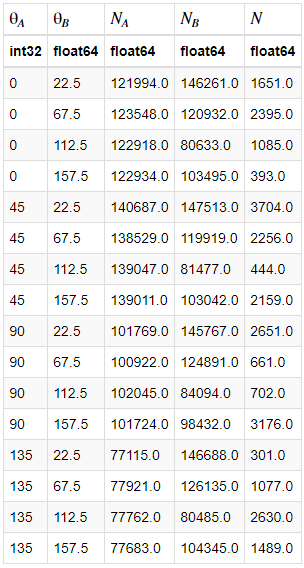 I used mass and radius values for stars for given spectral types from the very helpful table found at: http://www.isthe.com/chongo/tech/astro/HR-temp-mass-table-byhrclass.html. With hundreds of billions of stars existing in the Milky Way Galaxy alone, one can imagine there is a large deal of variety within the population. 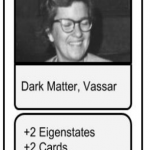 Naturally, astronomers thought it would be useful to categorize, if at least broadly, types of stars that share similar characteristics with each other. 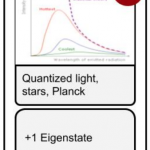 This classification system is known as spectral classification, assigning stars a letter (O, B, A, F, G, K, and M) primarily based on their observed spectra, which is dependent on the star’s temperature. Thus, stars of the same spectral type have similar temperatures, with O being the hottest, and M being the coolest. Further, stars of the same spectral type share characteristics such as mass and radius, which have accepted values. Deeper than their letters, spectral types are broken down more specifically by a following number (0 through 9). For example, O0 stars are more massive, larger, and hotter than O9 stars. Stars produce immense amounts of energy every second, thanks to quantum tunneling. There is no comprehensive classical approach to explaining how fusion could occur in stellar cores due to the Coulomb barrier; but very small, nonzero, probabilities of two protons tunneling does. 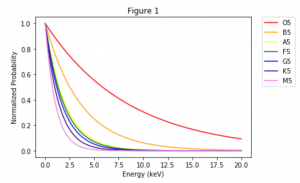 To determine fusion reaction rates inside of stars, we have to consider two probabilities: 1) the probability of a given particle having a certain energy and 2) the probability of a particle tunneling at a certain energy. Assuming a Maxwellian distribution of energies, these two work against each other in the way that there are less available particles with increasing energy, but higher energy particles have a higher probability of tunneling through the Coulomb barrier. For a given spectral type (since we have a given temperature), we can multiply these two probabilities to obtain a final curve that will have a peak known as the Gamow Peak. The area under the Gamow peak determines the reaction rate! Above is a plot of all the reaction probabilities for each spectral type. Since the luminosity axis of the H-R diagram is logarithmic, our dispersion in temperature is logarithmic, so I thought it would be a bit more useful to display the same plot from Figure 3, with a logarithmic y-axis. It can be seen that the Gamow Peak increases as temperature increases with spectral type, from the coldest stars at M5, to the hottest stars at O5. This indicates that the reaction rates will increase with increasing core temperature, which makes intuitive sense. However, it is more difficult to see a distinct “peak” from the curves of the really hot O5 and B5 stars, due to the increased energy in these cores. The effect of this is that fusion for heavier atoms through the CNO process actually dominates rather than the proton-proton fusion that dominates cooler stars like our Sun. 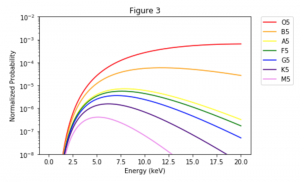 Still, the reaction rates for proton-proton fusion are much higher for hotter stars. This entry was posted in Bailey, QM on December 16, 2018 by Bailey. 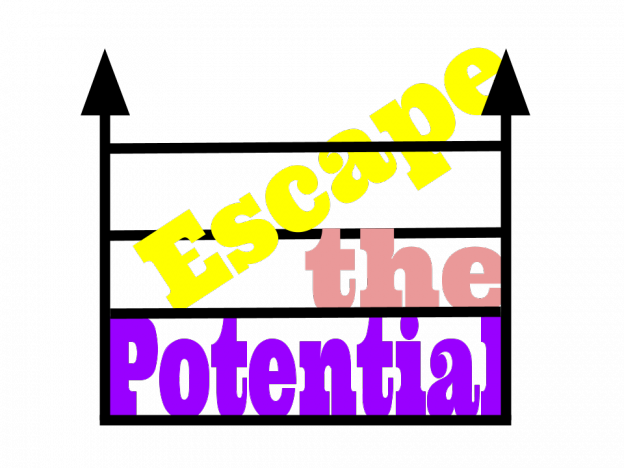 Escape the Potential is an educational game that I designed with Aidan. 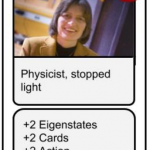 The main goal of this game is introduce quantum mechanics concepts to high school students with a background in physics. It could also be used as a review for college level students. While Aidan focused more on the logistical side of designing the game, I focused more on the pedagogy. This game is for 2-4 players and the goal is to ‘escape’ the potential well. 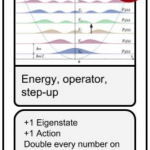 There are three different potential well boards you can choose to play with; infinite square well, finite square well, harmonic oscillator well (shown below). 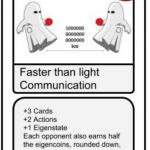 Each player starts with three cards in their hand. 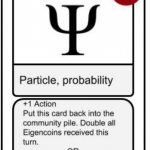 Players take turns playing their hand and earning eigencoins as they move up eigenstates in the potential well. 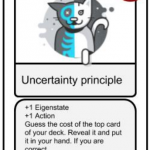 Once a player has earned eigencoins, they can choose to save them or to purchase new cards (shown below). Before they can purchase the new card though, they must learn about the card using the card appendix. 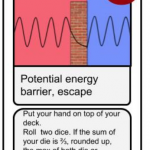 Over the course of the game, players purchase enough cards that they are able to escape or tunnel out of the well at the end of their turn. The complete set of rules are here. 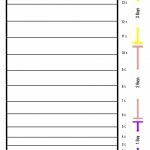 This game is simple to implement as a teacher. The thing the teacher should focus on is answering student questions and making sure the class is engaged. 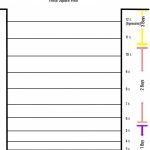 I created a potential lesson plan a high school physics teacher could use in the classroom. 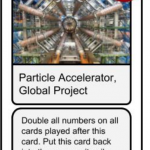 It would be an ideal game to play at the end of the school year after students have been familiarized with classical physics concepts. 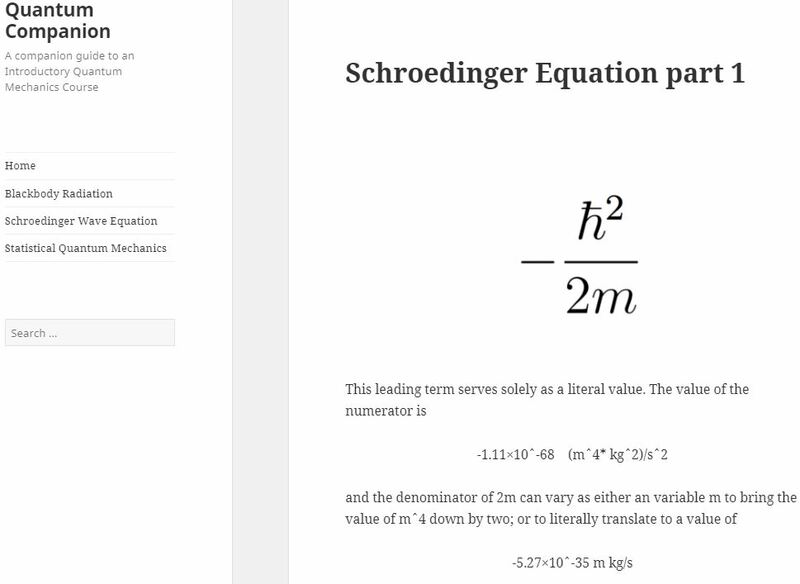 By teachers putting the spotlight on interpretations of quantum physics, students will be able to grasp the concepts instead of struggling with the complicated calculations. 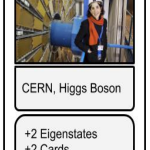 After playing this game, I want students to have a greater appreciation for the world and a broader understanding of what physics is and how it applies to them. 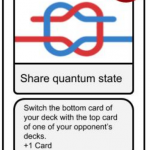 Making this game forced me to really make sure I knew the basics of quantum mechanics. Additionally, I got to learn about a range of complicated, fascinating quantum phenomena like quantum entanglement and action at a distance. I like making lessons plans, and it was nice to see my vision for the game evolve and come together in the end. 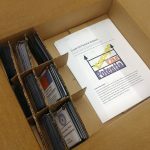 I wanted to create a fun and interactive way for high school students to get their first taste of quantum physics. After the initial struggle of coming up with what type of game we wanted to create and what we wanted students to get from it, the entire process was rewarding and fun. It was just a matter of researching, creating, playing, and revising our game. Escape the Potential would not have been the same if it hadn’t been for Aidan. He was very detailed oriented and on top of creating the foundations for our game. I enjoyed getting to be creative and applying some of what I’ve learned in my education courses to my physics course. Overall, my experience was positive and I grew from it. 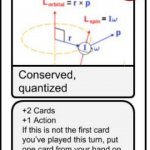 Our game is available to play in Sanders Physics 201.1. Not included in the picture are the “Eigencoins” used as currency in the game. They are large silver coins. All images are from Wikimedia and are available for use under the (insert link for creative commons). This entry was posted in Maddy on December 16, 2018 by mcrump. Protoplanetary disks are regions of planet formation around young stellar objects. Astronomers observe these regions to get snapshots of the planet formation process. Protoplanetary disks are optically thick at visible wavelengths, meaning that photons in the visible part of the electromagnetic spectrum from the star are absorbed by the disk and do not reach observers on Earth. Millimeter wavelength light is not absorbed by the disk as much, and so by observing light in that range, astronomers can learn about the morphology of disks. One key molecule abundant in protoplanetary disks is carbon monoxide (CO). Because of the low temperatures of disks (around 40 K), the energy transitions observed fall in the rotational and vibrational (rovibrational) regime. 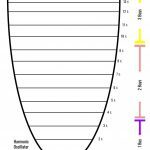 where v is the vibrational quantum number associated with different vibrational energy levels. 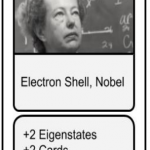 which has which as units of energy. 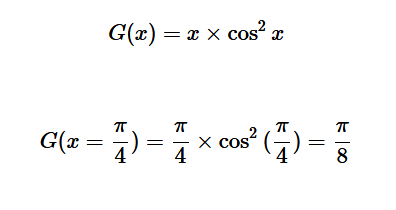 B changes based on the molecule, and for CO I found the value of B to be as listed above. 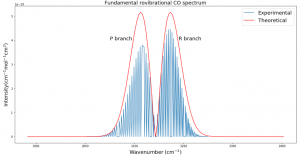 My goal with this project was to explore the fundamental rovibrational spectrum of CO. 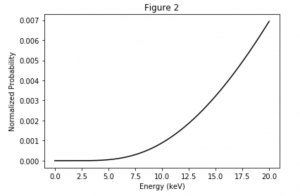 I first investigated energy in a rovibrational system and plotted how it changes for different rotational states. I did this using Python 3 and the libraries NumPy and Matplotlib. Then I modeled the intensity of different lines in the fundamental spectrum of CO and overlaid it with experimental data taken from the high-resolution molecular absorption database (HITRAN). where the first term corresponds to initial energy of the system before the transition. Though the energy of rotational states increases with increasing j, the difference between two consecutive levels is always 2B, where B is the rotational constant. This can be seen in Fig. 2. 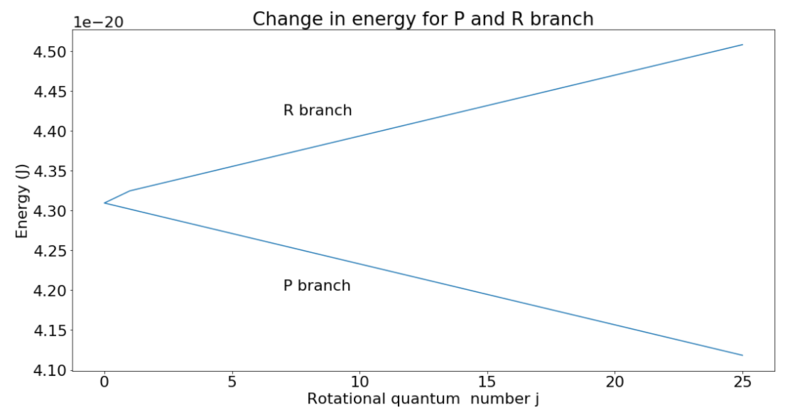 If going to a higher rotational state (in the R branch), add 2B to get the new energy level; subtract 2B for a lower state. Fig. 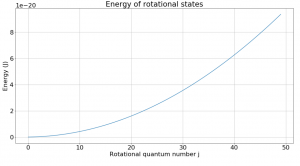 1 shows how rotational states increase in energy based on the equation listed above. 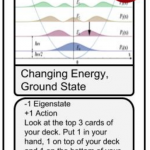 Despite the slope of this graph not being constant, a look at the change in energy between levels reveals an interesting fact about rotational transitions. Fig. 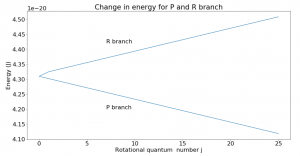 2 plots change in energy vs. rotational quantum number for the R and P branches. The Q branch is the corner point where no transitions occur. 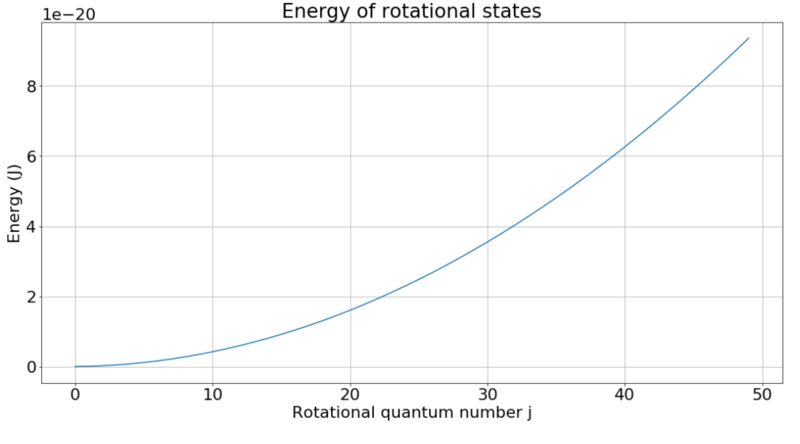 From the graph, we can see that if undergoing a transition on the R branch, the energy of the state will increase linearly from one state to the next. That change is given by the slope of the graph which was found to be 2B, as expected. Similarly, the P branch energy transitions decrease by 2B from one transition to the next. Note that the rotational quantum number j can only increase or decrease by 1 with each transition. where k is the Boltzmann constant and the temperature T was set to 300 K. The blue spectral lines come from experimental data from HITRAN. The x axis is given in wavenumbers, a unit commonly used in molecular spectroscopy. Fig. 3 was the most challenging result for me to produce and took several weeks of trying many different methods. Plotting the actual data was somewhat simple with Python, but calculating the relative intensities took me down many dead ends before finally getting the end result. 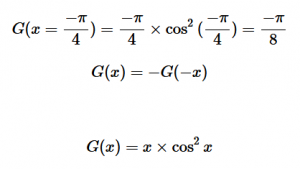 Different sources listed different equations for intensity and different values of B. Eventually after calculating my own B and using an equation from Bernath, I was able to get the desired result. I expected that the theoretical and experimental distributions would not match exactly, and that is because real molecules do not act exactly like rigid rotors. They experience centrifugal distortion and rovibrational coupling, which both add complications to the simplistic energy equations I used. However, my goal was to calculate the simplistic version of the fundamental rovibrational spectrum, and I accomplished that. In future work I would like to try to add complications to the model to better fit real data. I would also like to see how the environment of a protoplanetary disk could affect the spectrum. This entry was posted in Will on December 15, 2018 by widuffy. In this project, I (and partner Jay Chittidi) investigate the concept of quantum entanglement in an experimental context. 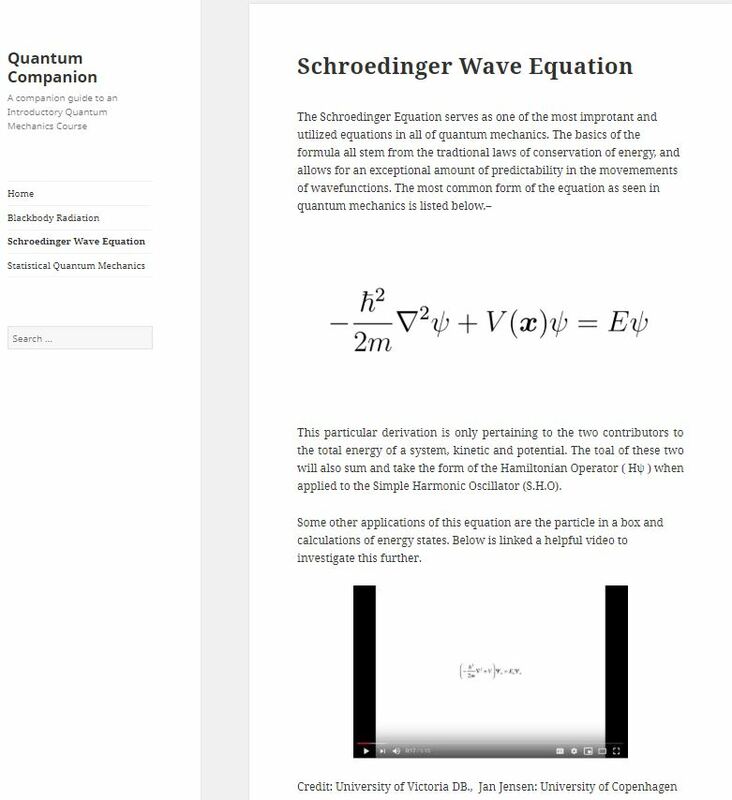 I will show how entanglement not only relates to the concept of superposition but also how it furthers our understanding of the differences between the laws of Quantum Mechanics and Classical Physics. Entangled particles are in a special kind of superposition of states such that either of their wavefunctions cannot be considered independently from the other. In other words, a measurement on one of the particles instantly affects that of the other. In this case, each photon is in a superposition of vertical and horizontal polarization and the coefficients A,B,C, and D represent the probability of measuring vertical or horizontal for each photon. In this case, both the photons have the same wavefunction, which depends on the horizontal/vertical polarization state of either photon. This means that any measurement of one photon will depend on the measurement of the other. 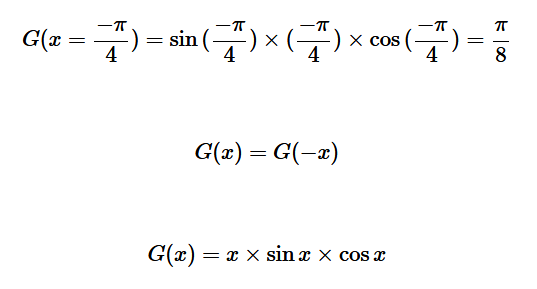 Note that there are multiple ways to achieve this; the equation above is just one example. Equation 3 shows that the non-entangled photon has an expectation value for the measurement that only depends on its own polarization state. In contrast, equation 4 shows that this expectation value for an entangled particle depends on the polarization states of both particles. Thus, at the time of the measurement, both particles will instantaneously collapse into corresponding states. We can also examine entanglement through the lens of hidden variable theory. 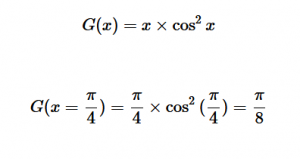 As stated above, when one measurement is taken from a member of an entangled pair, the other one instantaneously collapses into a corresponding state based on their mutually dependent wavefunction. Even if the photons are on opposite ends of the universe, this collapsing effect would theoretically be the same. If the wavefunctions collapse instantaneously even at astronomical distances, then information needs to travel faster than the speed of light. One explanation for this “magical” phenomenon is that there exist hidden variables that predetermine the outcome of each measurement before it occurs. In 1969, Clauser, Horne, Shimony, and Hotle (CHSH) created a generalized hidden variable theory which they used to derive an inequality that would only be true if hidden variables are at play in a given measurement. They did this by assuming the outcome of a given measurement depends on the independent parameters involved and some arbitrary “hidden variable” in some way. 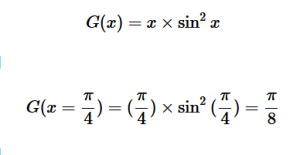 Then, they derive an expression, Bell’s inequality, which will always be true for a given set of measurements if hidden variables are involved. 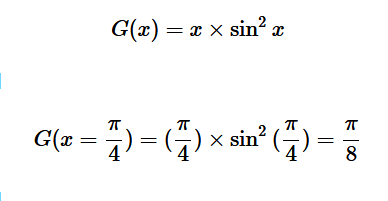 The derivation of this inequality is not trivial and purely mathematical, so it is not relevant to this project. They also proposed an experiment to test their inequality that consists of measuring the number of coincident photons as a function of polarization of either photon. If we can prove that no hidden variables exist, then we will show that the behavior of entangled particles contradicts our understanding of classical physics. To conduct our entanglement experiment, we utilized the phenomenon of spontaneous parametric down-conversion (SPDC). SPDC occurs when light passes through a nonlinear crystal (in our case BBO). A small number of photons that pass through the crystal split into two photons with equal energy that is half that of the incoming photons. They also have the same polarization that is orthogonal to the polarization of the incident photon due to conservation of angular momentum. In our experiment, we sent a purple laser first through a half-wave plate to polarize the laser light at 45 degrees. The polarized laser light then passed through two BBO crystals oriented perpendicular to each other. This means that the down-converted photons could either be horizontally or vertically polarized, but since we can’t predict which crystal produced the pair, we don’t know their polarization. This phenomenon causes the photons to be in an entangled state, where the measured polarization of one photon depends on that of the other. If the photons were not entangled, they would be in a randomly mixed state of horizontal and vertical polarization, whereas entangled photon pairs would have correlated polarizations. 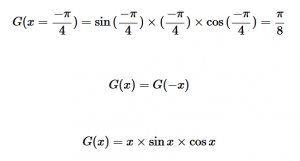 The following formulas define variables, E and S, which don’t have a physical meaning. 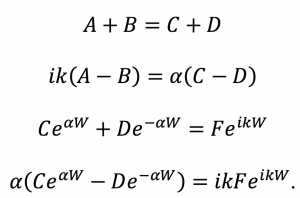 These formulas are just CSHC’s original hidden variable theory rearranged in a more convenient manner. 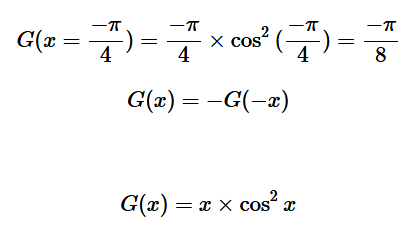 In these formulas, N is the number of coincidences recorded for the given combination of polarizer angles. Theta1 and theta1 prime are any two polarization and angles for detector A and theta2 and theta2 prime are any two polarization angles for detector B. Based on the work of CHSH S ≤ 2 if hidden variables are involved in the measurement of coincidences. Thus, the expected results of our experiment would be an S that is greater than 2. 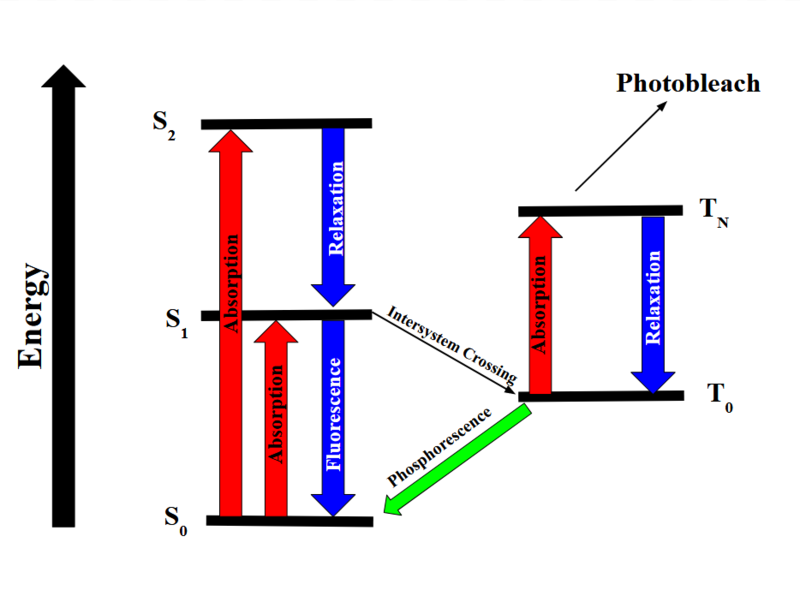 Figures 1 and 2 show our experimental setup. The laser is shot through the half-wave plate, the BBO crystals, and also a quartz that corrects for the phase shift of the laser light. 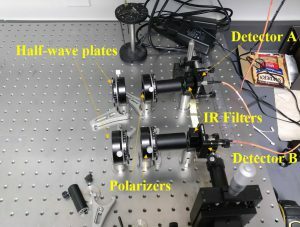 We can see that the two detectors on the other side of the optical table are approximately equidistant from the principle beam in order to detect the two streams of down-converted photons. There is a polarizer in front of each detector in order for us to test the CHSH hidden variable theory. We also placed infrared filters in front of each detector so that they would only detect the stream of infrared photons. We used a LabView program (made by previous Vassar students) to record the total number of coincidences in each a 10 second interval. A coincidence is recorded every time the detectors register a photon instantaneously. Since the down-converted photons are in an entangled polarization state and have correlated polarization, the number of coincidences is a function of polarizer angle. The number of coincidences is also the measurement needed to verify equations 5 and 6. Since S depends on configurations independent calculation of E, and each calculation of E depends on the number of coincidences at four polarizer configurations, we needed to measure the number of coincidences at 16 polarizer configurations in total. Table 1 shows the results of our experiment. The number of coincidences is clearly a function of polarizer angle, which indicates that the photons are in fact in an entangled state. Table 1: Coincidence counts and total counts in each detector at each of the 16 combinations of polarizer angles. The first two columns show the angle of each polarizer. The third column shows the counts in detector A, the fourth shows the counts in detector B, and the fifth shows the coincidence counts. Our final value of S, using equations 5 and 6 was -0.0465±0.0396. Unfortunately, this obeys Bell’s inequality for hidden variables, which is the opposite of what we had expected. We know from many previous repetitions of this experiment at other institutions, that Bell’s inequality should not hold in this experiment. The uncertainty in our value of S is also about the same as the calculated value itself, so we are not very confident in our result. There are various sources of error that could have resulted in the data we collected. There could have been some sort of light pollution that we weren’t accounting for or some hardware error. However, since our experimental setup has been extensively tested by previous students, these effects probably weren’t significant enough for us to get such an inaccurate value of S.
The most likely cause of the discrepancy between our data and the CHSH theory is improper alignment. Most of our time working on this project was spent attempting to align the laser. We struggled not only to align the detector with the beam infrared photons, but also to maximize the coincidences. For a more detailed description of our struggles, see Jay’s project. 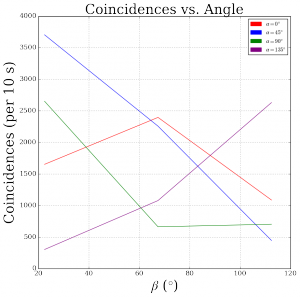 From comparing our data to the data collected by Dehlinger and Mitchell using a similar experimental setup, we have deduced that at a given polarizer angle for detector A, the number of coincidences should vary sinusoidally with the polarizer angle for detector B. Figure 3 shows that at the different values of angle for polarizer A, the number of coincidences does not vary in this fashion with the angle for polarizer B. We think that we could solve this issue by aligning the two detectors more thoroughly. The down-converted photons are actually emitted in ring, where photons across from each other are entangled pairs (illustrated in Figure 4). This means that if our detectors weren’t on the exact spots on the ring that correspond to an entangled pair, our data would not necessarily be consistent with CHSH theory or previous results. For future research, if we were able to place both detectors in some sort of circular mount with adjustable positions, then we would be able to more easily identify these exact positions. We also began our experiment with detector A already aligned and proceeded to align detector B. It is possible that we would have needed to align detector A more exactly in order to locate the correct ring positions. 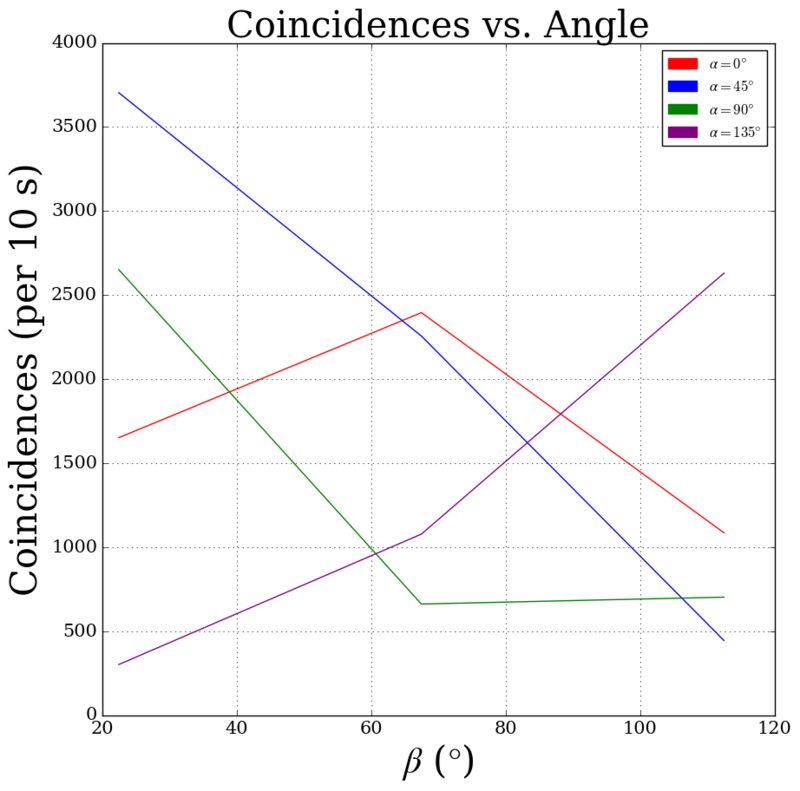 Figure 4: Number of coincidences as a function of polarizer angle for detector B (beta) at different values of polarizer angle for detector A (alpha). Figure 5: Schematic of SPDC. The entangled pairs are emitted in all orientations but at the same angle. They end up emerging from the BBO crystal in a ring shape, with entangled pairs exactly across from each other. Regardless of some clear experimental issues, we were able to observe quantum entanglement in action. Although the number of coincidences we recorded did not show the correct dependance on polarizer angle, they displayed a clear relationship. This is a clear indicator that when one member of an entangled pair is counted, the other must instantaneously collapse into a corresponding polarization state to be counted by the other detector. And although we did not end up disproving CHSH’s hidden variable theory, our calculation of S came with an unreasonable uncertainty, so our results cannot prove that hidden variables exist. 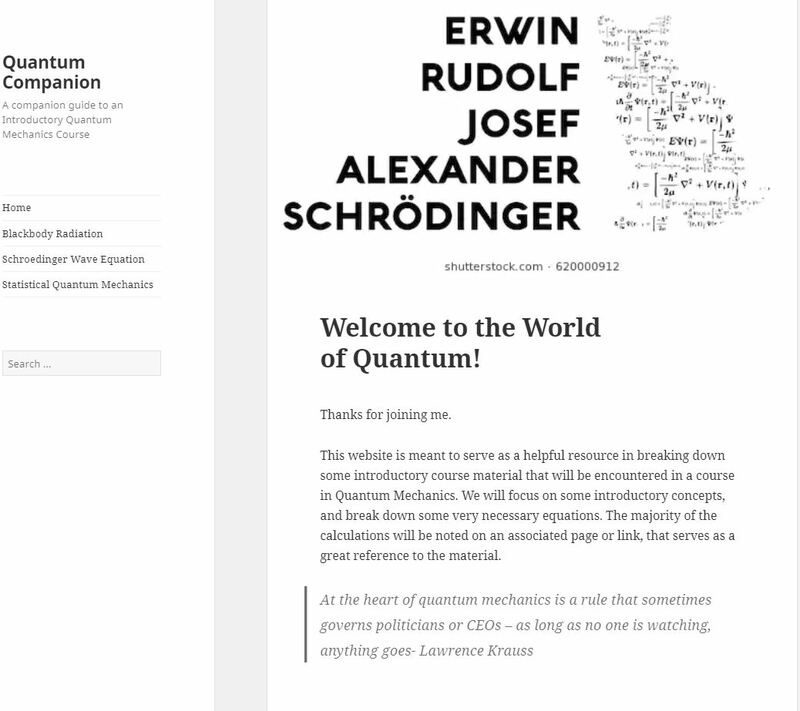 Inconclusive results aside, this project was very useful in illustrating the concepts of quantum entanglement and hidden variables, which relate to the most fundamental concepts of quantum mechanics such as superposition and deviation from classical mechanics. If anything, this experiment allows us to observe the oddity of quantum mechanics by simply counting photons. This entry was posted in Ellis on December 15, 2018 by ethompson.